The rising demand of curcumin in cosmetic, food, and pharmaceutical industries is the main factor driving the growth of the global curcumin market. A surge in demand of curcumin is mainly due to the increasing awareness among consumers regarding anti-inflammatory and anti-oxidant properties of curcumin. In addition to this, the rising inclination of consumers towards organic products is another strong factor likely to propel the curcumin market during the forecast period. According to the latest market report published by Transparency Market Research, the global curcumin market is expected to reach a valuation of US$ 465.8 mn by 2026. The market was noted at a valuation of over US$ 282.2 mn in 2018. If this stand true, the global curcumin market is projected to rise at a steady 6.5% CAGR from 2018 to 2026. The global curcumin market is classified on the basis of nature, form, application and end user. In terms of nature, the global curcumin market is segmented into organic curcumin and conventional curcumin. Among both of them, organic curcumin is likely to display highest CAGR during the forecast period. This is because of the increasing inclination of consumers towards organic based product. In addition to this, organic curcumin has relatively low side effects on consumers as compared to conventional curcumin. On the basis of form, the global curcumin market is segmented into powder and liquid. Among them, powder form is expected to display high demand in the coming years. This is due to their easy to store and transport properties. Based on application, the global curcumin market is segmented into heart health, brain health, stress/anxiety relief, anti-inflammation, antioxidant, and flavorant & colorant. The global curcumin market is anticipated to rise owing to the immense health benefits offered by curcumin to consumers. 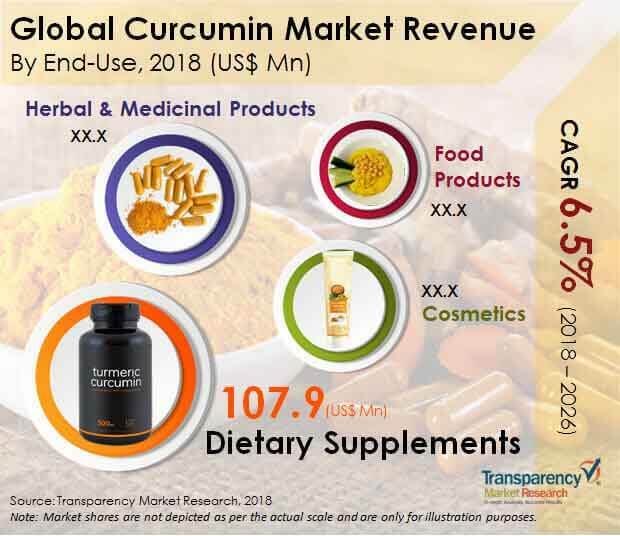 From end user standpoint, the global curcumin market is segmented into dietary supplements, food products, herbal & medicinal products and cosmetics. Among all of them, herbal and medicinal product is expected to hold highest market share in the global curcumin market when compared to other segments. In terms of region, the global curcumin market has been divided into North America, Europe, Asia Pacific, Middle East & Africa, and Latin America. Among all of them, North America is projected to account for the largest market share in the overall curcumin market. This is because of the high consumption of curcumin in the region. This is owing to the higher awareness regarding health benefits offered by curcumin. This plays a vital role in the growth of the curcumin maket in the region. Some of the major companies operating in the global curcumin market are Synthite Industries Ltd., Sabinsa Corporation, Biomax Life Sciences Limited, Jiaherb Inc., The Green Labs LLC, and Wacker Chemie AG. This report provides forecast and analysis of the global curcumin market. The report provides the estimated data for 2018, and forecast data up to 2026 in terms of revenue (US$ Mn) and volume (MT). The report also includes macroeconomic indicators, along with an outlook on curcumin for the global market. It includes the drivers and restraints of the global curcumin market, and their impact on each region during the forecast period. The report also comprises the study of current industry trends and opportunities for curcumin. It also includes value chain analysis. In order to provide the users of this report with a comprehensive view of the market, we have included detailed competitiveness analysis, market key players, and strategic overview. The dashboard provides a detailed comparison of curcumin manufacturers on parameters such as government certifications, product offerings, and key strategies & focus areas of the company. The study encompasses market attractiveness analysis by nature, form application, end use, and region. Through a detailed study of the market, our analysts have observed that, there is a tendency amongst the end users of curcumin to shift from conventional curcumin to organic curcumin, which is likely to result in an increase in market demand over the forecast period. The report further states that, the use of curcumin in the food industry as a supplement is likely to result in a lucrative market opportunity for the producers of curcumin targeting this segment. On the basis of end use, the herbal & medicinal products segment is expected to hold the highest market share when compared to the other end uses in the curcumin market. On the basis of region, the North American curcumin market is expected to hold the highest market share throughout the forecast period, owing to more consumption of curcumin as a food supplement in the region. Following North America, the European curcumin market is expected to hold the second-largest market share throughout the forecast period. The report includes the company profiles of key producers of curcumin, and the revenue generated from companies across North America, Latin America, Europe, Asia Pacific (APAC), and the Middle East & Africa (MEA). For the estimation of revenue, regional average prices were obtained through quotes from numerous curcumin producers, exporters, and distributors. The report covers area under turmeric production, per hectare yield, production of turmeric for demand side analysis import-export scenario turmeric is tracked for key countries. All the key application segments of curcumin have been considered, and potential applications have been estimated on the basis of secondary sources and feedback from primary respondents. Some of the key data points collected for the modeling approach include the food and beverage sector overview, regional food and beverage outlook, average usage of supplements, including curcumin in food products, and others. The market has been forecasted based on constant currency rates. A number of primary and secondary sources were consulted during the course of the study. Secondary sources include Factiva, and Hoovers, and company annual reports and publications. This report covers market dynamics related to curcumin that include the drivers, restraints, and trends driving each segment and opportunities in the curcumin market. The report also includes analysis and insights into the potential of the curcumin market in specific regions. Detailed profiles of providers are also included in the scope of the report to evaluate their long-term and short-term strategies, product portfolio of curcumin producers, and recent developments in the curcumin market space. Some of the major companies operating in the curcumin market space are Sabinsa Corporation, Synthite Industries Ltd., Biomax Life Sciences Limited, Hebei Tianxu Biotech Co., Ltd, Jiaherb Inc., Herboveda India Pvt. Ltd, The Green Labs LLC, and Wacker Chemie AG, among other curcumin producers.